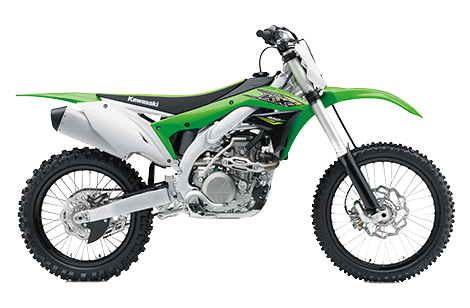 The KX™450F motorcycle is the most powerful, lightweight, and agile KX450F ever. Developed from the highest levels of racing, this championship bike has advanced technology sourced straight from the world’s premier race team. Sporting the same ground-up revisions from the 2016 model, the light and powerful 2018 KX450F provides sharp handling and strong circuit perfromance that dominates the 450cc motocross class. The 2018 KX450F has maintained the KX design philosophy which stretches back to the creation of the Kx brand more than 40 years ago; place mid-level to expert riders on the top step of the podium, every time. *Finance from BMW Financial Services (a division of BMW Australia Finance Ltd, Australian credit licence 392387) on a consumer loan at 7.29% pa. On a ride away price of $11,850.00 and no optional extras with 60 monthly repayments of $248.45 and a final payment of $248.45. Total amount payable is $14,907.00. No other offers apply. Fleet, government & rental buyers excluded. Fees, charges, terms, conditions & approval criteria apply. Offer applies at Brisans Motorcycles while stocks last on new motorcycles. Offer valid as of 20/04/2019. ^Comparison rate based on monthly repayments for a 5 year secured consumer loan of $30,000. WARNING: This comparison rate is true only for the example given & may not include all fees & charges. Different terms, fees or other loan amounts might result in a different comparison rate. Enquire now with one of our business managers for further details on 02 4940 8777.